Full Disclosure: This guide is not sponsored by any cereal company or restaurant but I wish it was! It’s National Cereal Day today! I’ve been wanting to do a Fruity Pebbles guide for a while now, and National Cereal Day gave me an excuse to go broader and glean the area for cereal treats! Cereal is such an underrated comfort to me. I have childhood memories of early mornings spent sleepily eating cereal before school and memories from my early adulthood of bachelorette “dinners” spent on the couch nursing a big bowl of cereal while watching Ally McBeal. Even more recently, when Sugarface was away on a work trip, I spent all week eating Froot Loops for dinner. 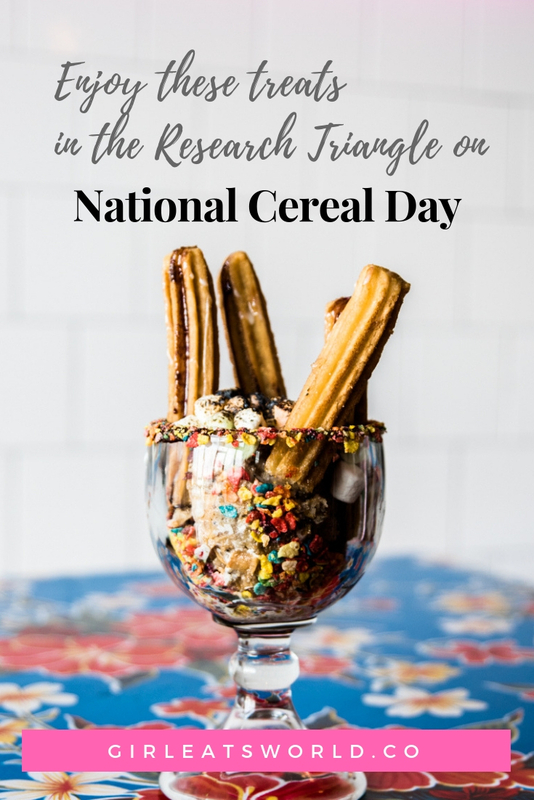 So I’m excited to share with you these treats around the Research Triangle that creatively incorporate classic childhood cereals! 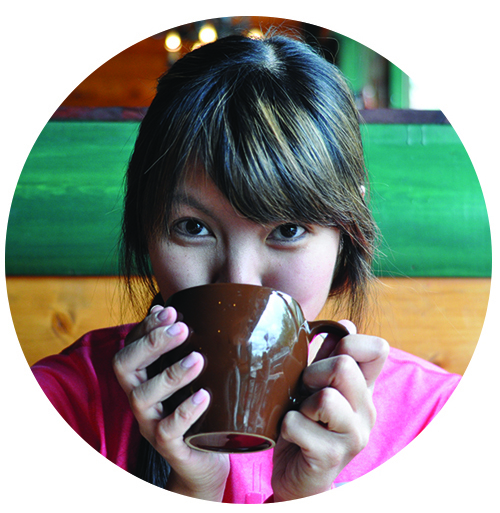 I had the pleasure of getting to know the owners of Andia’s Ice Cream over their creamy creations. It’s clear they not only care about the quality of their ice cream, but they also have so much fun coming up with new flavors and dessert combinations. They also host monthly events to cater to their young patrons where they bring in superheroes and Disney princesses to hang out! 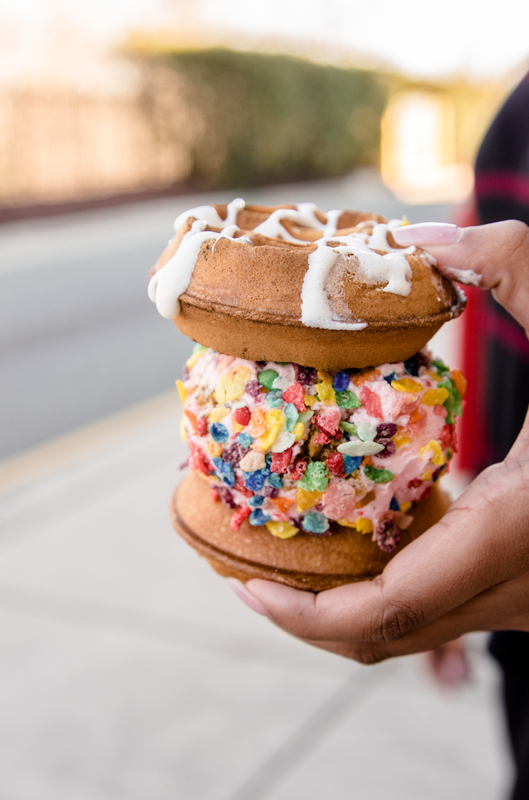 During my last trip to Andia’s, I had a Belgian Waffle Sandwich with Rose Pistachio ice cream rolled in Fruity Pebbles. We weren’t sure if the rose would go well with Fruity Pebbles, but I was happy to play quality assurance and now assure you these flavors complement each other. The subtle floral note of the rose complemented the “fruity” flavors of Fruity Pebbles. Andia’s makes the waffles to order which makes these sammies even more enjoyable because who doesn’t like the combination of warm carbs and cold ice cream? 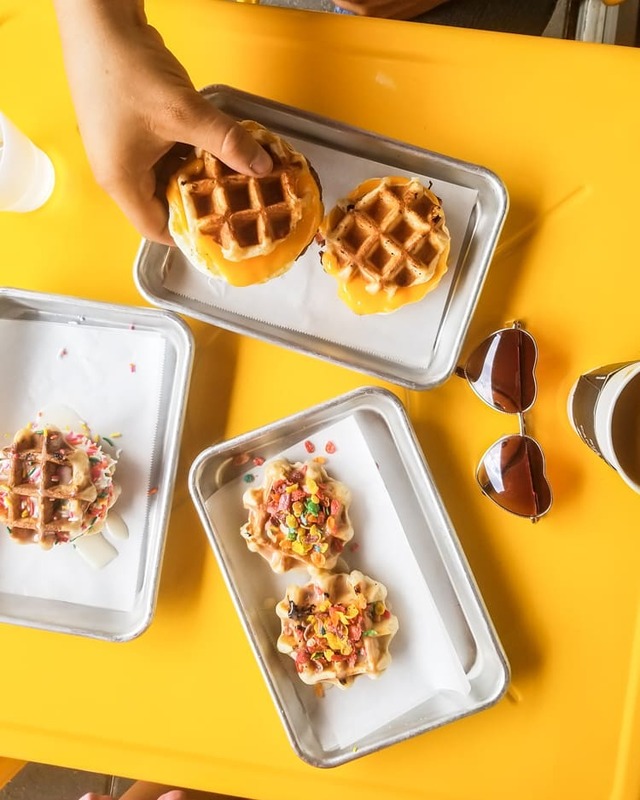 Smashed Waffle Company serves a delicious variety of sweet and savory waffles that will satisfy just about any craving. I’ve liked everything I ordered (their sausage and cheddar waffle sandwich is so good! ), but I’m giving a special shout out to them for their Cereal Thriller waffle, mini warm waffles drizzled in vanilla icing and sprinkled with Fruity Pebbles. Aren’t they darling? 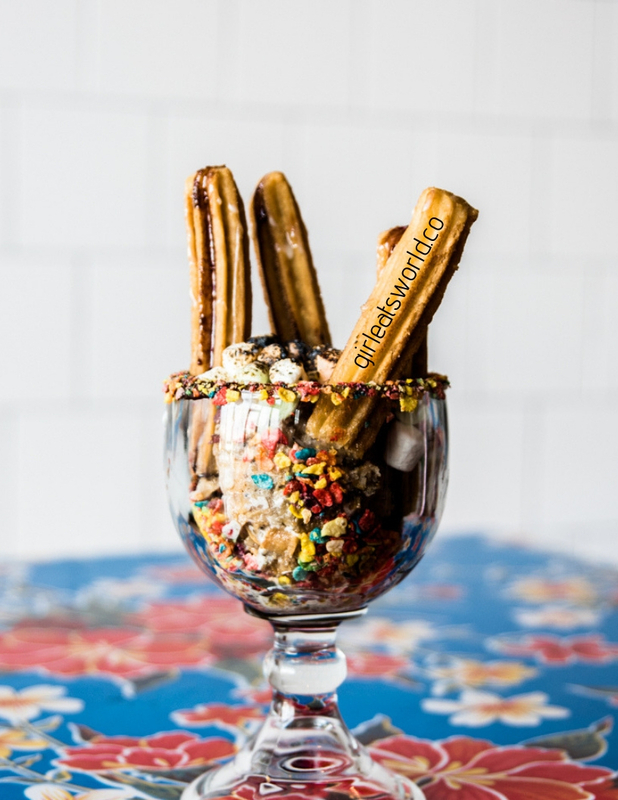 This churro sundae dessert served in a Fruity Pebbles rimmed goblet took my dang breath away! I couldn’t believe how ridiculous it looks! So I found two eating buddies with the help of putting out an S.O.S. on Instagram. My Instagram-turned-real-life friends, Emily and Tauris helped me eat this dessert. I have to be honest and say I didn’t expect it to taste very good. I guessed it would be too rich for me and after about two bites, I’d be done. I’m happy to report that I was so wrong and we scraped the whole goblet clean. The churros were warm and drizzled in chocolate. We already know warm churros and ice cream are a great combination but throw in roasted marshmallow and Fruity Pebbles and you graduate a few levels in the school of Ridiculously Delicious Dessert category. I thought I’d only order this once for my cereal guide but am proven wrong because I’d order this again and again. A waffle made out of Cap’n Crunch cereal? Count me in! 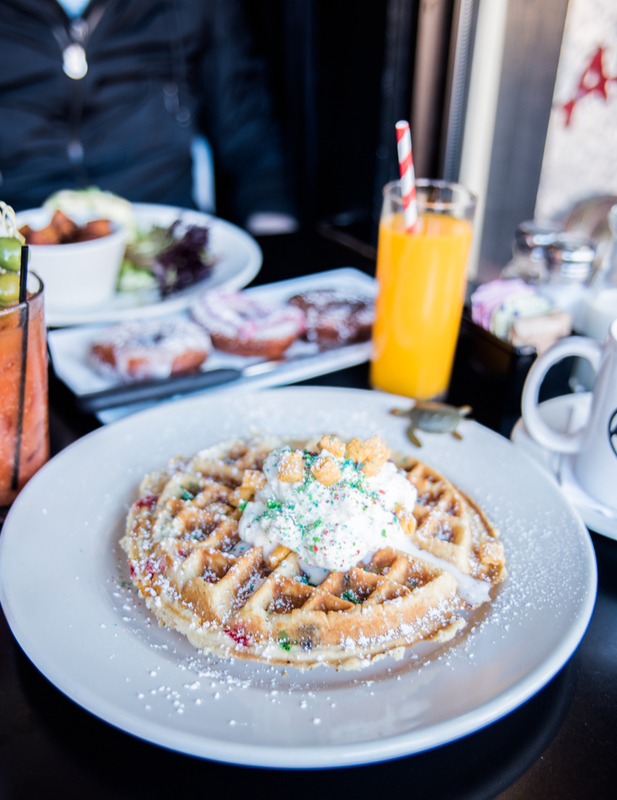 One of my favorite brunch spots in the Triangle introduced this waffle this past winter. I knew I’d like it, but I didn’t expect to experience a state of childlike joy. You can find it on their Sunday Brunch menu listed as That 70s Breakfast. The waffle comes with a glass of Tang. Drinking it took me back to elementary school. And then as if I wasn’t giddy enough, Chef Kevin Callaghan came out with a box of “cereal toys” that I could pick from. Remember when cereal boxes had toys!? I picked a plastic . His name is Frank, and he lives in my camera bag now. And finally, that waffle was dang good. Texture and flavors were perfect, and I felt like Will Ferrell in Elf eating it. If you’re feeling removed from your inner child lately, may I recommend That 70s Breakfast from Acme? When I asked on my Instagram stories for cereal dishes, my friend Cady mentioned a cocktail by Cortez Seafood and Cocktails. It felt serpentinous because I had just first heard of Cortez when it was announced that their chef, Chef Oscar Diaz was nominated for a James Beard for Best Chef Southeast! One of their bartenders, Megan Corbally, created the cocktail she calls, the Monday Morning. It is made of spiced rum, Pops cereal and clove infused coconut milk, coconut cream, pineapple, orange, and lime. It comes in nostalgic Pops cereal cups. I’m happy I finally made my way to Cortez and cannot wait to go back! We snacked on their oysters and Chowda Fries and totally understand that James Beard nomination now! What I like most about Duck Donuts is that their donuts are made to order. If you’re quick to eat them after you order them, they’re warm and gooey. Through March 17th, Duck Donuts is featuring a new Lucky Duck Assortment offering. 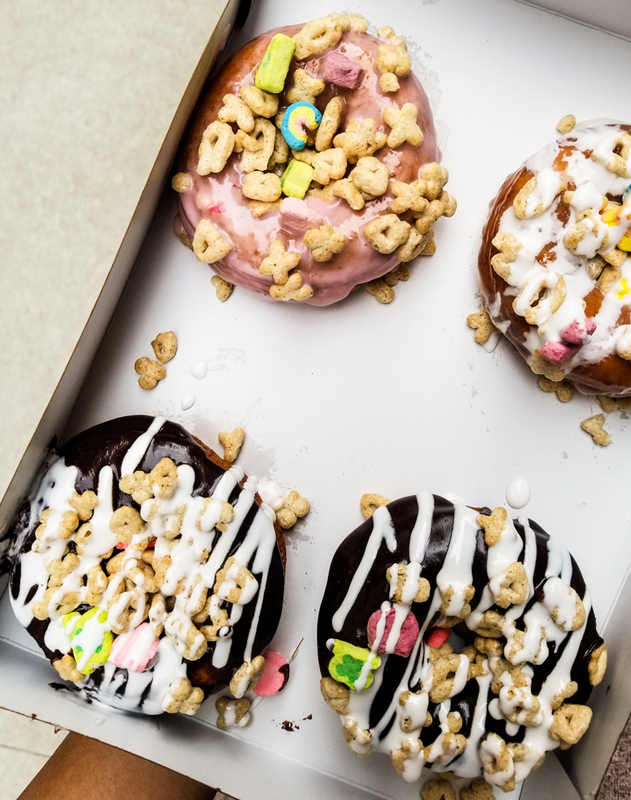 These Lucky Duck Donuts are topped with Lucky Charms! This magical marshmallow cereal topping has never been featured as a topping before by Duck Donuts, so they’re extra special. Run and get them before this seasonal feature leaves their menu! 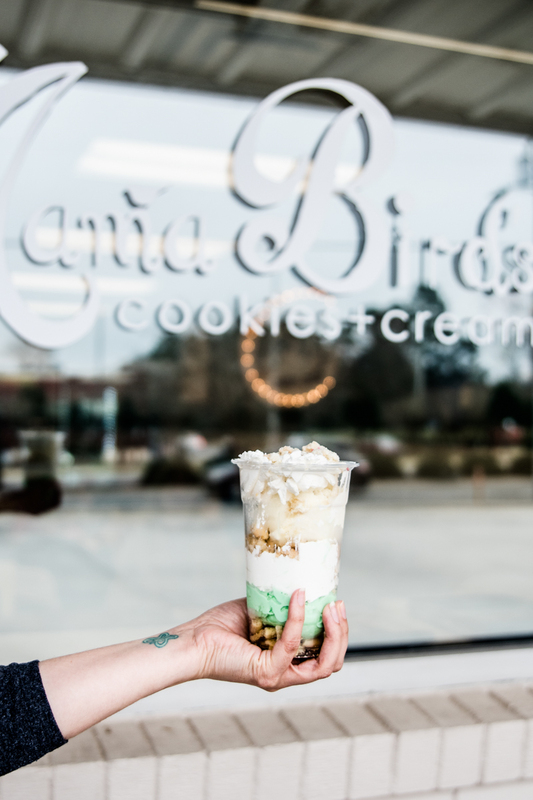 And another seasonal item featuring the iconic childhood cereal, Lucky Charms, is Mama Bird’s Cookies and Cream Shamrock Sundae. Through March 17th, you can get their Shamrock Sundae. It is a sugar cookie sundae with two scoops of Magically Delicious ice cream, a drizzle of marshmallow sauce, and topped with whipped cream and salted milk crumbs. Available now through St. Patrick’s Day. Magically Delicious ice cream is the special ice cream flavor for March, a marshmallow flavor ice cream sprinkled with Lucky Charms. I customized my Shamrock Sundae by subbing one of the scoops of ice cream for yet another cereal flavor, their Snap, Crackle, and Pop flavor. I felt lucky indeed to come across two cereal flavors in one darling ice cream shop. 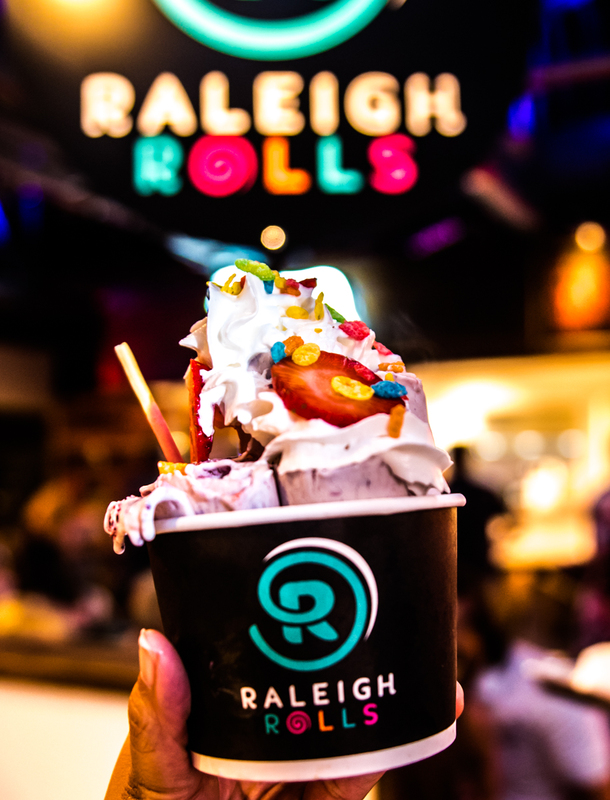 I love that Raleigh Rolls is housed inside Morgan Street Food Hall, making it convenient to grab lunch or dinner before rolling up to Raleigh Rolls. If you’re overwhelmed by all the options available to design your own dessert (the options are endless), then they have a menu you can order from. Their ice cream is rolled to order and fun to watch. 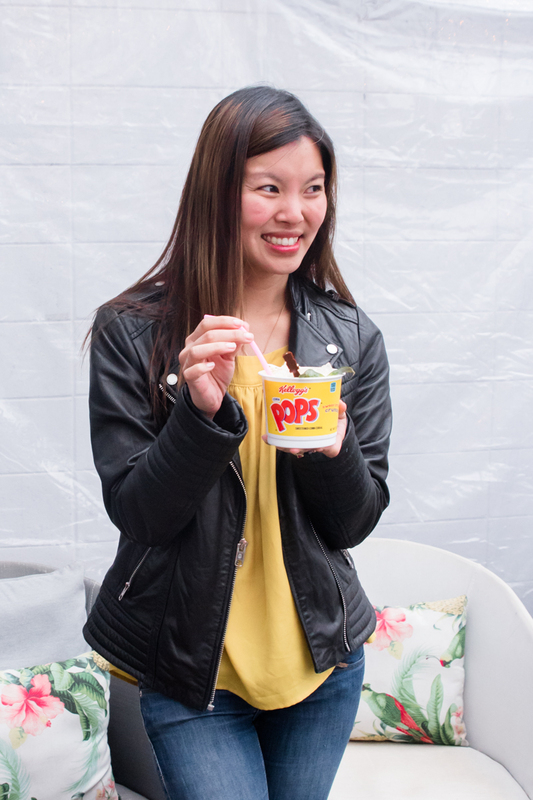 I created my own ice cream flavor by having them use strawberry Pocky, fresh bananas, and Fruity Pebbles. It was SO good. I’m going to stick with that combination for the next few trips to Raleigh Rolls. And that concludes my cereal tour of the Research Triangle! I hope you enjoyed reading this guide. If I missed out on any of your favorites, please reach out to me and let me know! So tell me, friends. What was your favorite cereal from your childhood?